If you plan on shipping us your 6.7 Powerstroke DPF System, be sure to follow this guide for properly cutting it into easy-to-ship pieces. The pieces in the second photo are the only ones you’ll need to ship to us to receive payment. If you have any questions, be sure to contact our team and we’ll be happy to assist you. Additional information for powerstroke dpf system recycling. 6.7L Ford Powerstroke DPF systems can be difficult to ship because they are large and bulky. Cut them down as seen in the example of this picture so they will weigh less and will be easier to ship. Remove the parts that we do not purchase and discard them. This will cause the shipping to be much more manageable. Shipping via freight is your best option if you have several systems because they will not have to be packed individually. Contact us and we will get a freight shipment scheduled at a time that works for you. If you are shipping multiple DPF system via freight, you do not need to cut the systems. Only cut down your DPF system when you are using UPS Ground. 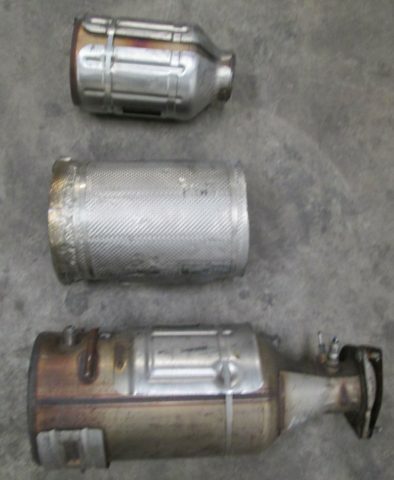 The 6.4L DPF and catalytic converter can be unbolted from each other. After unbolting, trim of the excess exhaust pipes. If you choose to use our UPS labels or a freight option for recycling your DPF systems, we pay 100% of your shipping costs. Ship your used DPF system in the smallest package possible. This enables us to keep our prices higher for all of our customers! Use extra tape when packaging your units so your package will be strong. As a result, your package will be secure during transit. If you have any questions, please let us know. We are always happy to explain the process and help our customers! Powerstroke dpf system after being cut for shipping.